Build Diary – 4. It’s getting real! This may throw our regular readers – if there are any – but nothing seriously weird happened this week. Yet, anyhow. But keep reading! This week we finished pulling motor connections and the dash and heater controls plus the slower draining fluids finally trickeled out (you should have seen that coolant) so we’re down to just the motor mounts and the transmission and axles to get the motor out. Thursday night we took the trailer up to the shop with the Jeep and, as we had access to a winch – totally safe, really – we used that to pull it onto the trailer instead of trying to push it. At this point The Manchurian does not roll well, nor easily. Or maybe we’re just wusses. 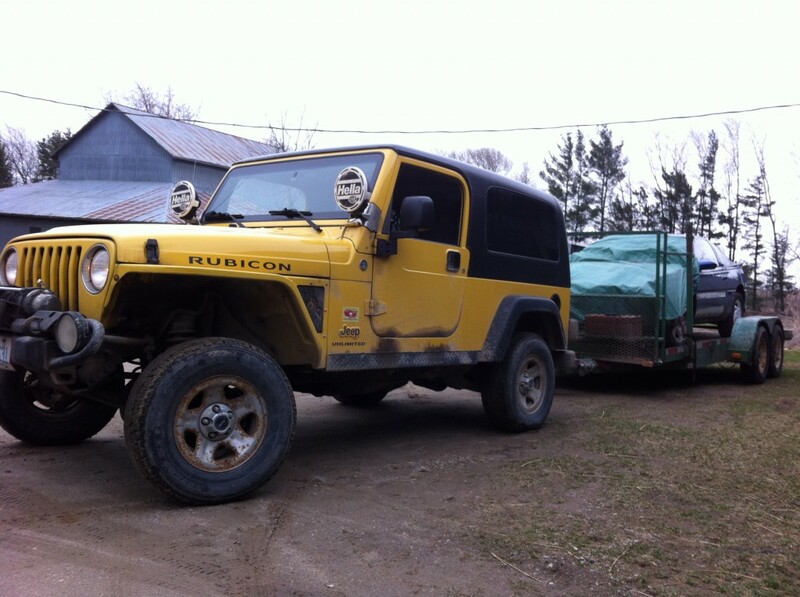 Jeep with just the (about 2000 lbs) trailer. Looks pretty happy and towed pretty well like this even with the winter tires on and no trailer brake controller. 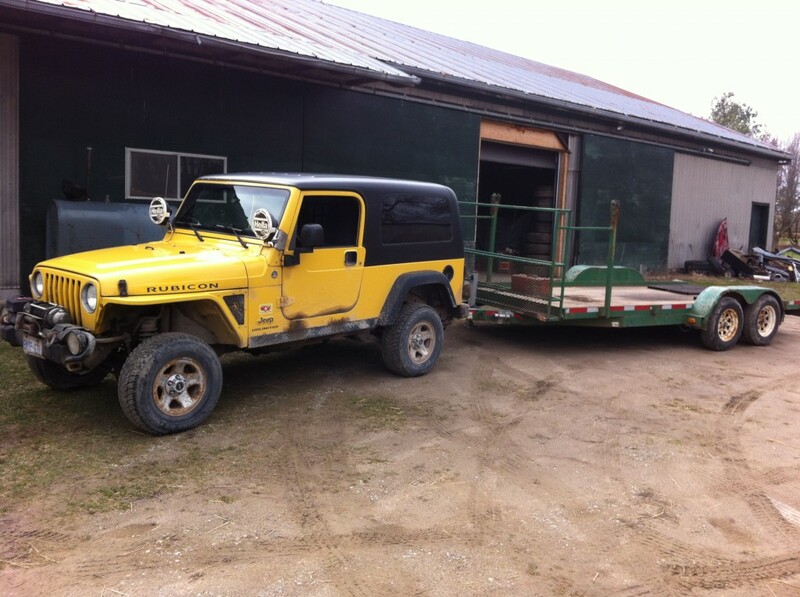 Versus this – the Jeep with the (about 2000 lb) trailer AND a Talon on it. We went about 50 meters like this – just needed to shift it slightly. It didn’t like it much and would have been a hazard on the road. On Friday Drew brought his F-150 (better idea) and we hauled it down to Rally/Race for Ryan. Ok, from here on it’s R3. On Sunday we went to HSL RallySport to pick up some goodies on our way to R3 so we could go over the plans for the cage. Check out the junk in this trunk. 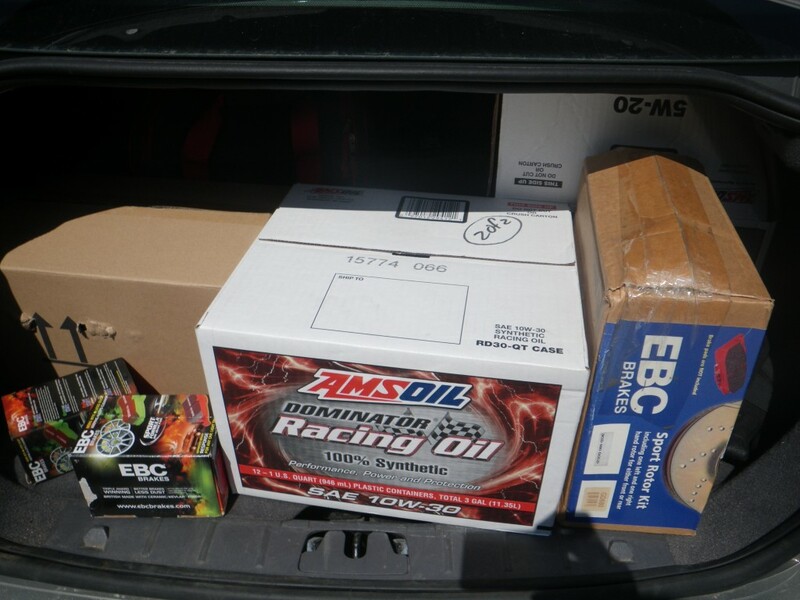 We’ve got EBC slotted and dimpled rotors, EBC Red Stuff brake pads, AmsOil racing oil and filters, severe gear oil, transaxle oil… It’s a trunk full of goodness! 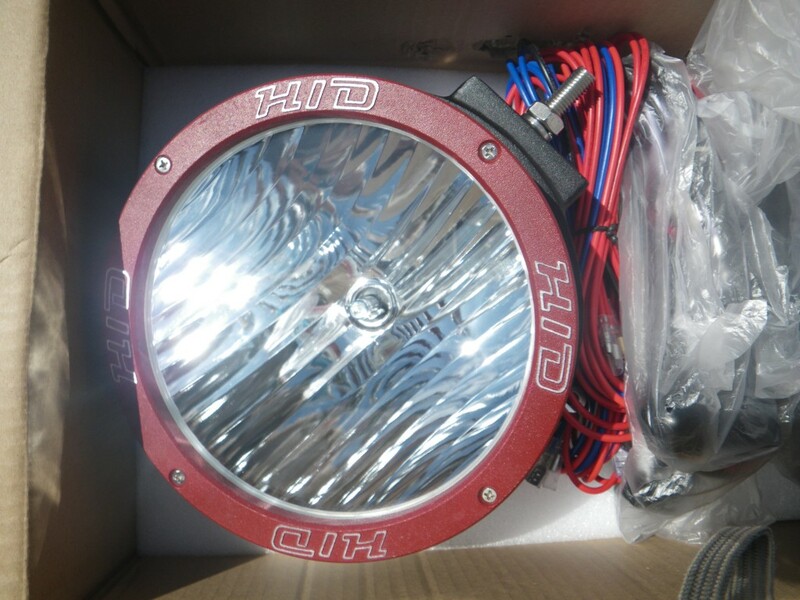 Plus we got an HID conversion kit and some 55w driving lights! All from Paul at HSL RallySport.The lights looked so cool we wanted to bolt them on immediately but since the bumper is in another town – Alliston, along with the fenders and etc – that will have to wait a bit. Why are we replacing the brakes, you ask? 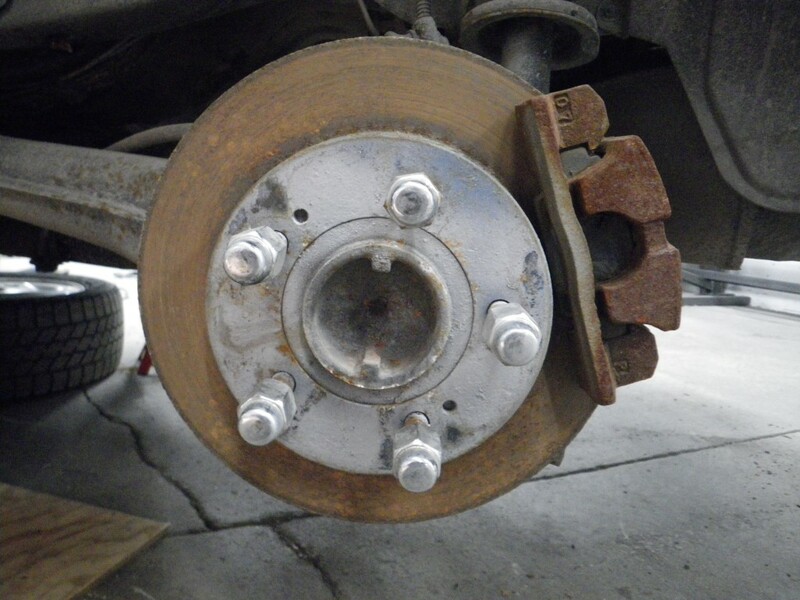 Well, we think the current state of the brakes has something to do with the car not rolling very well. 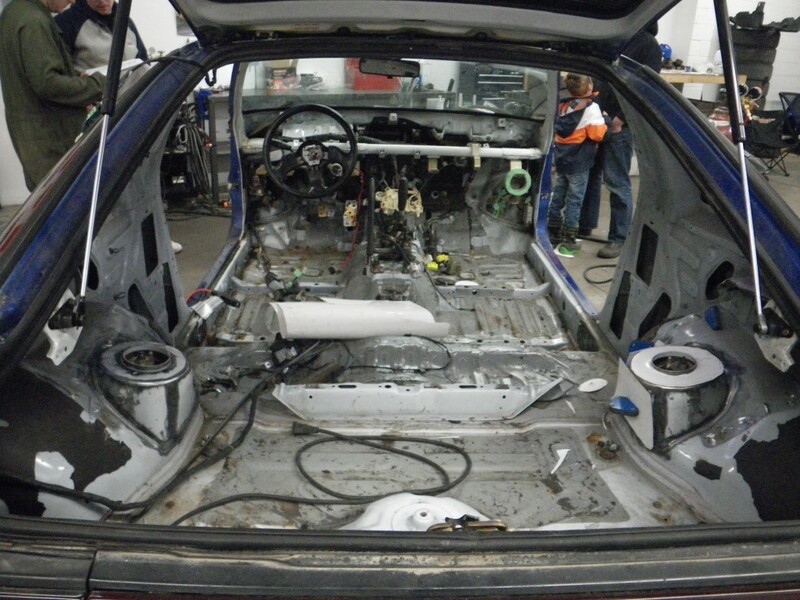 When we got to R3 the doors were already off and the proper cleanup had been started, which is pretty cool to see after all this time unbolting things and scraping things and generally feeling not very rally-car-like. See the rear shock towers getting all prepped, metal bits getting cut away, etc? That’s rally car business right there! And no hammers in sight so you know it’s getting done right. That there is exciting. (Quickly checks to see if there are in fact any hammers in this picture). What’s nice is that there are go-fast parts available on this continent and at reasonable cost. Coincidentally, our previous rally car – the Lada Samara – was also a 1991, but getting performance parts outside of Eastern Europe was tricky. In a way that was it’s strength, though – it was over-built for the power it had/speed it could achieve and was crazy reliable as a result. On the other hand, given the lack of power anything on the Lada – power brakes, power steering, power windows, power of horses – it’s hard to picture the two competing for the 1991 new car buyer’s dollar.